Senator Chuck Schumer (D-NY) is making news just before President Trump gives his first State of the Union speech. Schumer wrote an op-ed in The Washington Post and made remarks on the Senate floor about the upcoming address by President Trump. In The Washington Post piece, “What I’m listening for in Trump’s State of the Union,” Schumer wants to hear about the president’s infrastructure plan. On the Senate floor, Schumer said President Trump should thank former President Obama for the good economy. “If you’re going to pat yourself on the back, give a shoutout to Barack Obama because he did even better than you in job creation,” he said. The Schumer talking point about the economy and jobs is the same argument that former President Obama made during a speech this year. At a conference of mayors in Chicago, Mr. Obama congratulated himself Tuesday for strong employment numbers in the U.S. this year, saying his climate-change policies have contributed to growth. 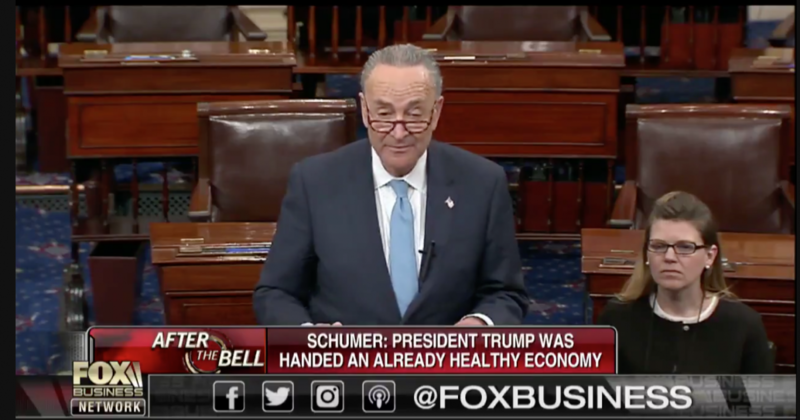 Democrats know President Trump will highlight his successful first year as president during the State of the Union speech and Schumer is trying to get some of his talking points in the news cycle.